This programme will adopt a natural science approach and it aims to provide students with an in-depth understanding of theories, practices, research methods and skills in the field of environmental science and the application of these knowledge and skills in government, industrial and environmental conservation sectors. Holders of a Higher Diploma, Associate Degree, or equivalent in relevant science disciplines, may apply to this programme. 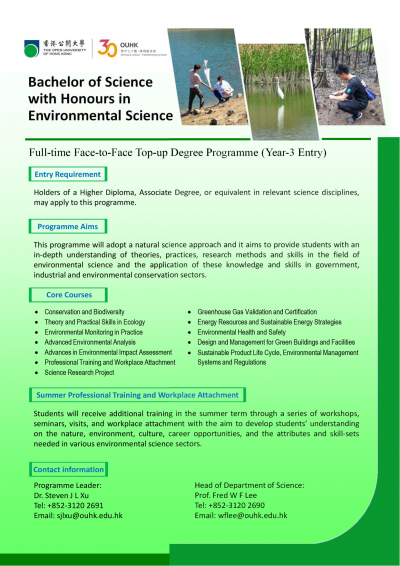 Students will receive additional training in the summer term through a series of workshops, seminars, visits, and workplace attachment with the aim to develop students’ understanding on the nature, environment, culture, career opportunities, and the attributes and skill-sets needed in various environmental science sectors.